Seeing a woman today stopping to fix her clearly broken slop (aka these days as ‘Flip-Flops) here in the UK made me smile as it brought back very happy memories as a Mabelreign kid (in 19-footsak). 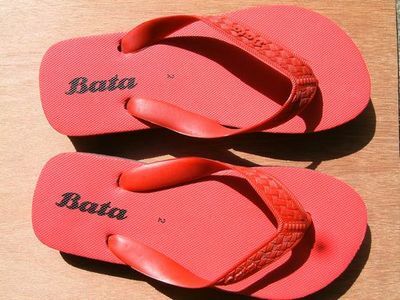 Bata slip-slops were our common foot-wear and worn till the soles were worn thin and the edges curled up like an airline sandwich before new ones were allowed. But who remembers how we ALWAYS wore them to slop around through mud and puddles after the rains – and every time a coconut!! – one slop would vacuum-stick in the mud whilst the foot surged forward wrenching the middle thingamajig between the toes out of its socket causing us to slip and hop around trying to regain or maintain our balance. This never failed to amuse our mates with guffaws and jeers leaving us grinning sheepishly and muttering “It’s not FUNNY! !” whilst struggling to repair the slippery, mud-soaked slop getting ourselves covered with mud in the process. What fun – and did that ever stop us playing in puddles and mud pools? Never! No chance. And we continued to love and wear our slops till-they-dropped off our feet! !